Image by alisofff via FlickrWhen making the drive down the Pacific coast with clients now I usually act like I'm looking for something like all good guides do (I happen to "not" be one of those "Eagle Eyes" guides but when you get in the looking position your clients think you are and it adds a moment of excitement to the bus ride). Well as of late the Central Pacific is one of the best spots for a guide or anyone to give this little trick a try. If you are around Carara or just past Jaco before arriving to Hermosa beach keep an eye out for the Macaws in the trees or flying around in pairs. They are making a comeback which is good to see but we cant forget that this species is still endangered. The last study showed that there are around 430 Scarlet Macaws in the Central Pacific of Costa Rica. Which is the countries second largest population. The Central Pacific hopes by 2020 to have a population of 1000 which would be amazing and quite the site the way these birds like to make themselvese seen and heard. If you are on a Costa Rica vacation and want to see the largest population of Scarlet Macaws then the Osa Peninsula is still where you will find between 700 - 900 of these birds. Its a sure bet upon arrival to the Osa you will see and hear the Macaws. 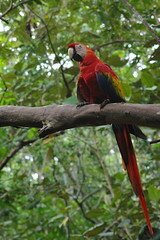 If your interested in planning a family vacation to Costa Rica contact us and we promise we will find some scarlet macaws during your stay http://www.crrtravel.com/ or info@crrtravel.com.